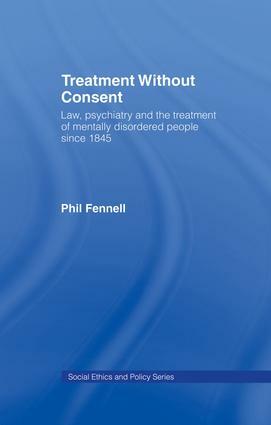 Phil Fennell's tightly argued study traces the history of treatment of mental disorder in Britain over the last 150 years. He focuses specifically on treatment of mental disorder without consent within psychiatric practice, and on the legal position which has allowed it. Treatment Without Consent examines many controversial areas: the use of high-strength drugs and Electro Convulsive Therapy, physical restraint and the vexed issue of the sterilisation of people with learning disabilities. Changing notions of consent are discussed, from the common perception that relatives are able to consent on behalf of the patient, to present-day statutory and common law rules, and recent Law Commission recommendations. This work brings a complex and intriguing area to life; it includes a table of legal sources and an extensive bibliography. It is essential reading for historians, lawyers and all those who are interested in the treatment of mental disorder. 1853–1880: THE TRIUMPH OF NON-RESTRAINT?